. Elisha Williams Jr (5). Elisha Williams Jr is a son of Elisha Williams and Sarah Josey. Elisha Williams Jr is not to be confused with Elisha Williams, son of Josiah Frederick Williams. 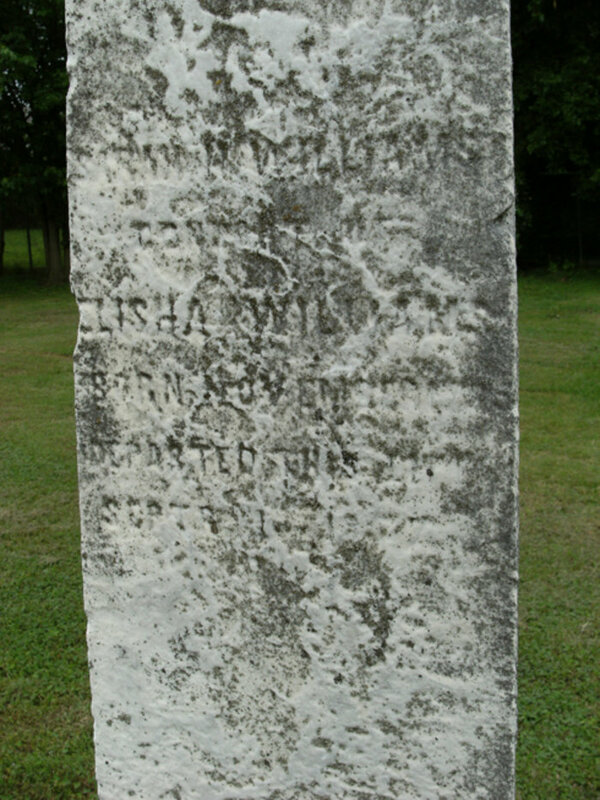 This Elisha Williams was a brother of Josiah and lived for many years in Rutherford County TN, farming and raising his family. 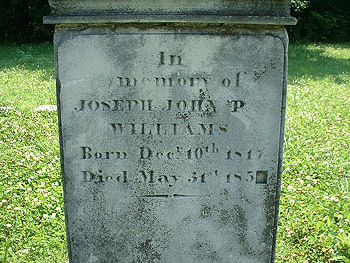 He also is not to be confused with his son, Elisha Williams III who died relatively young and is buried in the Old City Cemetery in Murfreesboro, Rutherford County, TN. Sarah Hay had been married to Samuel Jones Ridley until he died in 1827. Elisha Williams and Mary "Polly" Philips produced the following children from their marriage. Graduated from the University of Nashville in 1844.
estate administrater James Exum Sumner, Sr.
Elisha Willliams Jr arrived in Nashville TN late in 1805 with his family, consisting of his father Elisha Williams, his mother Sarah Josey, his brother William Williams who had graduated from Harvard Law School, and his brother Josiah Frederick who had completed two years at the University of North Carolina. Josiah is my direct ancestor. A daughter, Elizabeth "Betsy" Norfleet Hunter Williams, remained in North Carolina with her husband, Joseph John Williams Jr. They lived on a plantation in Warren County NC. Elisha and his family came to Nashville from a farm they owned six miles east of Louisburg, Franklin County NC at the urging of Elisha's good friend Joseph Philips who purchase 640 acres 6 miles north of Nashville on Dickerson Pike when he arrived in 1792. He had come from the Swift Creek area north west of Tarboro NC where he had a large farming operation. Elisha Sr was in poor health (he would die in 1911) and wished to provide for his three sons. He split the 640 acres on Gallatin Pike about 4 miles north of Nashville between Josiah and William. Some time between 1805 and 1814 Elisha Williams Jr moved one county over to Rutherford County TN where I have been told his father purchased land for him. 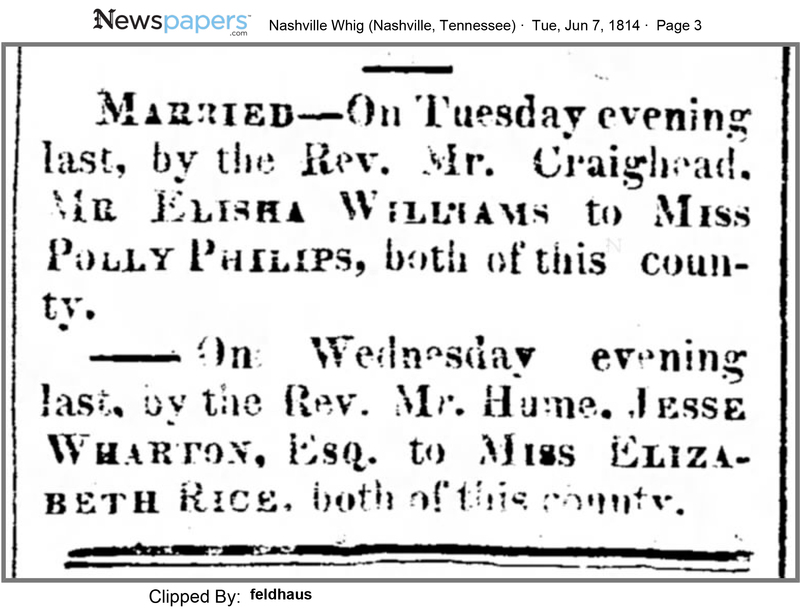 Elisha Jr married Mary "Polly" Philips on 30 May 1814 in Davidson County TN. Her father lived and died in Davidson County, and the license was issued in Davidson County. Sarah Josey Ray WILLIAMS , Elisha and Polly's daughter, has a web page on this site with a copy of the Rutherford County Historical Society Vol # 9 describing the relationships between the Philips' family and her husband's family. 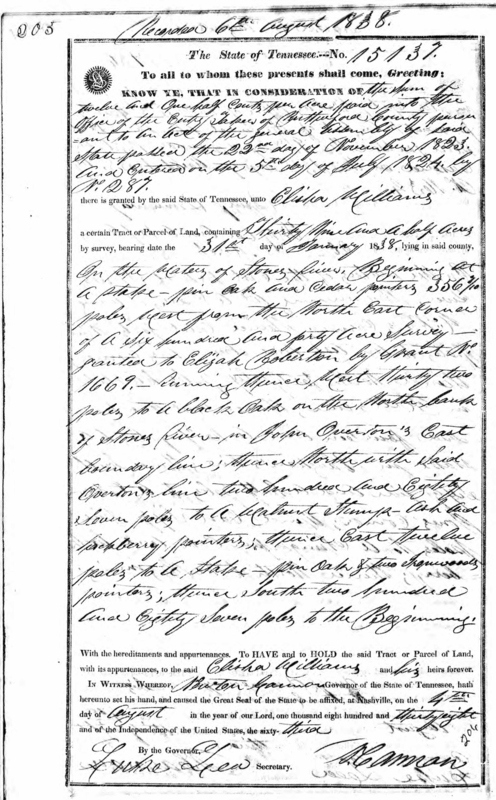 That document profiles Polly's brother, Judge Joseph Philips, and his second marriage to Dorothy Drake who is the widow of Joseph John Sumner. Joseph John Sumner is a son of my relative Joseph Philips' sister, Martha Philips. 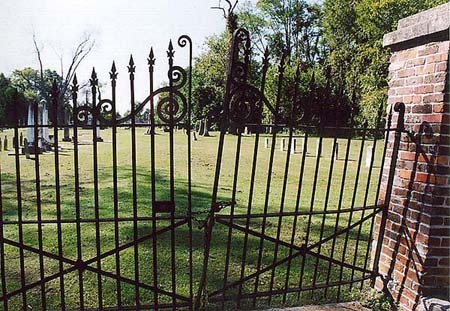 He drowned in a storm in Louisiana at a young age and was later buried in the family cemetery, Sylvan Hall, on Joseph Philips' farm on Dickerson Pike in Davidson County. The book "Early Settlers of Alabama was written by James Edmonds Saunders who died in 1896 and was acquainted with many of the Philips family that married the Elisha Williams who lived in Murfreesboro. The below exerpt from that book gives us insight into the relationships between the families and the origin of this Philips family. Clearly this is a seperate Philips family from the Joseph Philips family that lived on Dickerson Pike six miles north of Nashville beginning in 1791. Born in Virginia 1806, Died 1896. NOTES AND GENEALOGIES BY HIS GRANDDAUGHTER ELIZABETH SAUNDERS BLAIR STUBBS, NEW ORLEANS, LA. The Philips Family was descended from Philip Philips, who was born in Wales. He settled first in Pennsylvania, then Kentucky, and thence to Davidson county, Tenn., near Nashville, about 1795. 1.Nancy, the wife of Daniel Gilchrist. 2. Her brother Judge Joseph Philips and his wife, I knew well in Nashville sixty years ago, when I was a raw young student of law. I boarded opposite their dwelling, and well remember the kindness shown me by this family. The judge was a man of varied experience and extensive learning for that day, and of pleasing manners. I returned to Alabama, and a term of thirty-six years passed away, during which, Judge Philips had departed this life; but his wife survived him. Their daughter had married Major John W. Childress, of Murfreesboro. I was prostrate, in 1863, at that place, from a wound supposed to be mortal, when Mrs. Philips paid me a visit of sympathy. She brought her whole family several times afterward, consisting of her daughter, Mrs. Childress, Major Childress (who was a brother of Mrs. President Polk), and their lovely daughter, Miss Bettie, who afterward married John C. Brown, a major general of distinction during the civil war, and afterward, Governor of Tennessee. I understand they have several living children — all daughters. My readers will pardon me for extending the notice of this branch of the Gilchrist family so far, for their kindness to me in the condition, prisoner in the midst of a hostile camp, has made a deep impression on my memory, and on my heart. My friend, Dr. James Wendel, of Murfreesboro, informs me that " Major John W. Childress first married the daughter of Elisha Williams, whose wife was a Philips, sister to Judge Joseph Philips. She died leaving six children, four sons and two daughters. The elder one married J. M. Avent, a lawyer of Murfreesboro. The other (as you state) married Gen. John C. Brown; both are living. Three of the sons are dead. His second wife is a daughter of Judge Philips; of course, cousin to the first. Major Childress died in October, 1884, leaving six children by the second wife ; three sons and three daughters. Judge Philips died in 1856 or 1857. His widow at the advanced age of ninety, or more, died in November, 1881. Gen. Robert Purdy and wife I knew in my boyhood days. They died in this place, she some years before him. The sisters of Mrs. Daniel Gilchrist were Eleanor, Elizabeth and Mary. 3. Eleanor married Major James Neely, and Rev. Philip Philips Neely, D. D., a Methodist minister of celebrity, was their son. In the latest history of Alabama, by Brewer, a sketch of his life is given. The author after mentioning a number of representative men who have lived in Mobile, and of the learned professions, such as John A. Campbell, of the Bar; Josiah C. Nott, of Medicine; John Forsyth, of the Press; Jones M. Withers, of the Army; and Raphael Semme, of the Navy, selects Dr. P. P. Neely as the representative man of the pulpit, in a city always noted for the ability of its ministers. In concluding his sketch he introduced the following estimate of him as an orator, furnished at the request of the author, by Bishop Payne: "As a preacher Dr. Neely had few equals. He was keenly alive to the beautiful and sublime, and his rare powers of description enabled him to portray his vivid conceptions with thrilling effect." 5. Mary, who married Mr. Elisha Williams. Daniel Gilchrist and Nancy Philips reared a family of four children, and reared them well, and they, in their turn, have reared children, and although the connection is so large, I know of no failure among them. The old gentleman died 24th July, 1850, and the old lady in May, 1863. I will notice their children in regular order. (1) James Harvey, who was born in 1850, and married Nannie Bankhead in 1874. They have only one child, who married (in 1896) Lawson Sykes, grandson of Mr. Oakley Bynum, Sr., of Courtland, Ala. (The father of Mr. Bynum, Drew S. Bynum, came from North Carolina) . (2) Malcolm (the Fourth), who was born in 1853, and married Mary F. Burkhead, who soon died, leaving one child. (3) Philip, who was born in 1854, and died, unmarried, in Mississippi. 2. Philip Philips Gilchrist was born 20th November, 1825. He too has always been a cotton planter, but sometimes in public life, and has represented this county in the House of Representatives. He was married three times. First to Sarah E. Moore in 1847, who died in 1849. Had one child, Daniel. Secondly, married to Ellen Philips in December, 1851. They had one child, Joseph P., now a young man. Philip P., who married Mattie Carter-, Ellen A., who married D. L. Martin; George G., Malcolm P., Alice Armine, William G., and Daniel. 3. John A. Gilchrist, the third child of Daniel Gilchrist and his wife, Nancy Philips, married first Texanna Jones. The only child by this marriage is William, who married Agnes Darrell. They have one little daughter. The second marriage of John A. was with Addie Michie, of Charlottesville, Va. Their children are James B., Annie K,, and Agnes E. John A. has always been a cotton planter. 4. The fourth child of Daniel Gilchrist and his wife was Katherine Gilchrist, who was born 4th of June, 1830. She married (first) George W. Garth, in 1851. Of his military services, we spoke in former pages. By this marriage the only living children are; Kate, who married Rev. Robert Means DuBose, who was descended from a South Carolina family, and George W., who married Kate W. Burt. They have several children. Thos. Man Randolph, of one of the most distinguished and wealthy families of Virginia, married Martha Jefferson, eldest daughter of the President. Anne Gary Randolph was a daughter of this marriage and married Charles L. Bankhead, and our worthy neighbor, Capt. W. S. Bankhead was a son of this marriage. Thomas Jefferson Randolph was a brother of Capt. Bankhead's mother, and to this grandson Mr. Jefferson in his will bequeathed all his manuscript papers, which were published in four volumes under the title of "Writings of Thomas Jefferson." These volumes are the repository not only of his State papers, but of hundreds of his letters. Good judges have pronounced these letters to be written in the finest epistolary style of any extant in America or Europe. (first) Martha J. Watkins, daughter of Paul J. Watkins. There was no issue of this marriage. And his third marriage was with Mrs. Kate Garth, as we have said above. One son, John Stuart Bankhead, was born of this marriage, but he is not now living. Capt. Bankhead's military services, during the late war, have been spoken of. 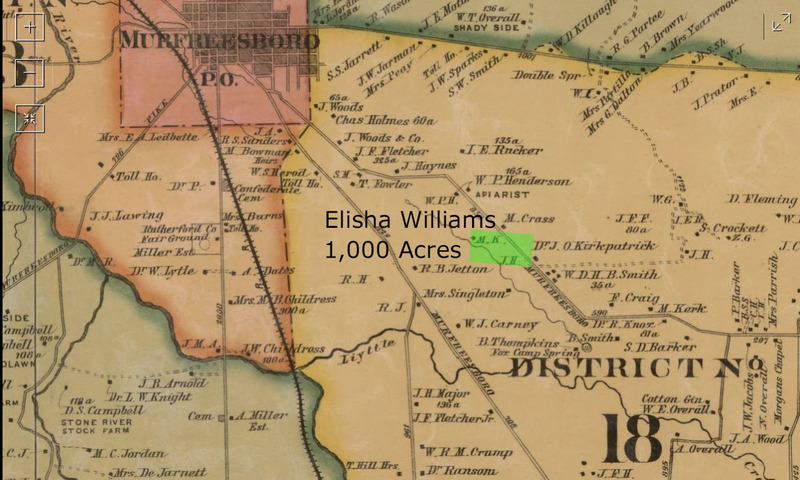 I have not been able to locate a deed showing that either Elisha Williams Jr or Sr purchased land in Rutherford County between 1805 and 1814 when Elisha Jr married. Certainly by then he had moved there and begun farming. His father died in 1811 and it is likely that before then he had purchased land for Elisha Jr in Rutherford County. 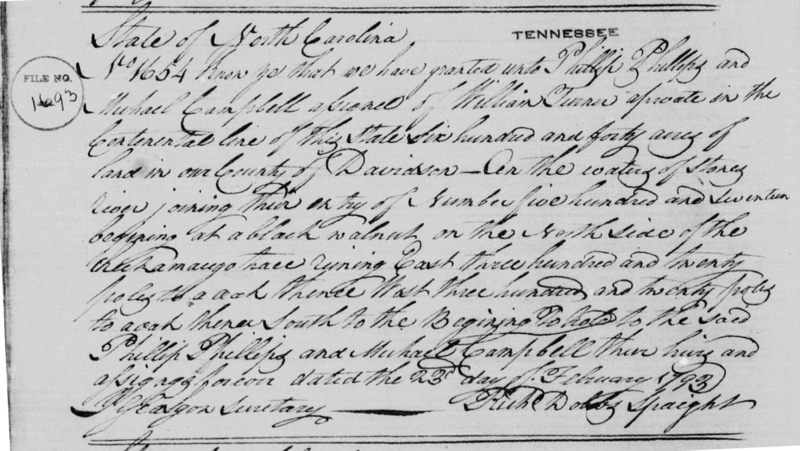 According to Gwen Boyd of Murfreesboro, Elisha Williams purchased a tract of land that was part of or the whole parcel that was originally Military Warrant 3155, located 19 Feb 1788 and granted 23 Feb 1793 as recorded in the Davidson County Grant Book 76, page 337, File # 1691. This grant was assigned by Etheridge Newton to Phillip Phillips & Michael Campbell, land speculators. The land was sold to John Williams and then to Elisha Williams Jr. So far, I have been unable to substantiate that Elisha actually purchased this 1,000 acre grant. However, it is referenced in two grants that he did purchase. I was able to locate this grant online. Click here to view. The map below was pieced together from maps contained in the book "Thoroughfare for Freedom, Volume II, The Second Atlas of the Cumberland Settlements 1779-1804." These maps locate original land grants on maps and identify them by the grantor, acreage, and grant number. 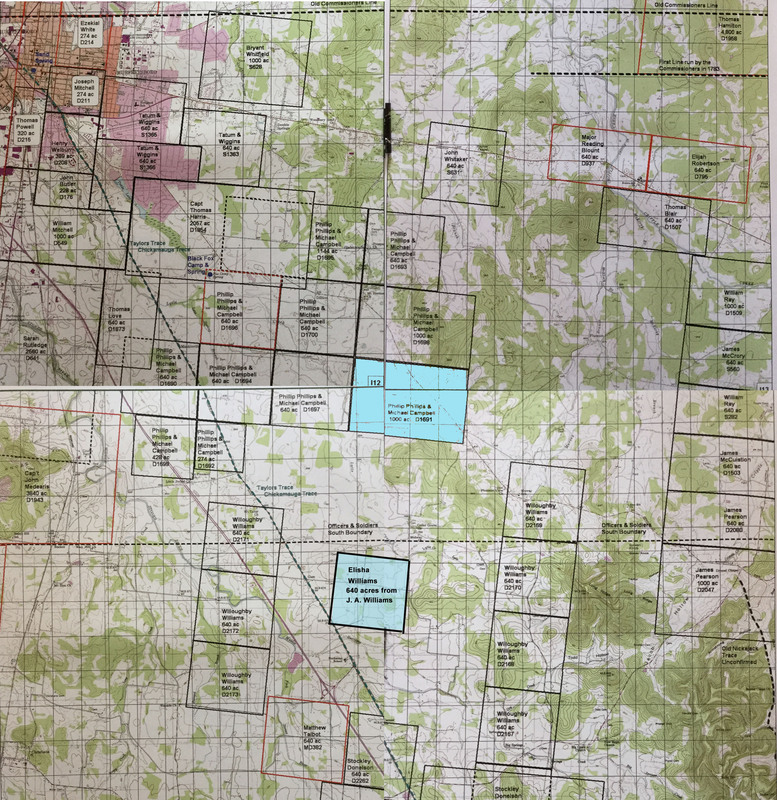 The 1,000 acre grant that Elisha Williams purchased is identified as being owned by Phillip Phillips & Michael Campbell with the identifying number of D1691. It is located in the middle of the map, which is a modern topographical map. Click on the map to view a larger version to read the details on the map. The grant location is shown below on a 1878 Map of Rutherford County TN on file at the Library of Congress and available online by clicking here. 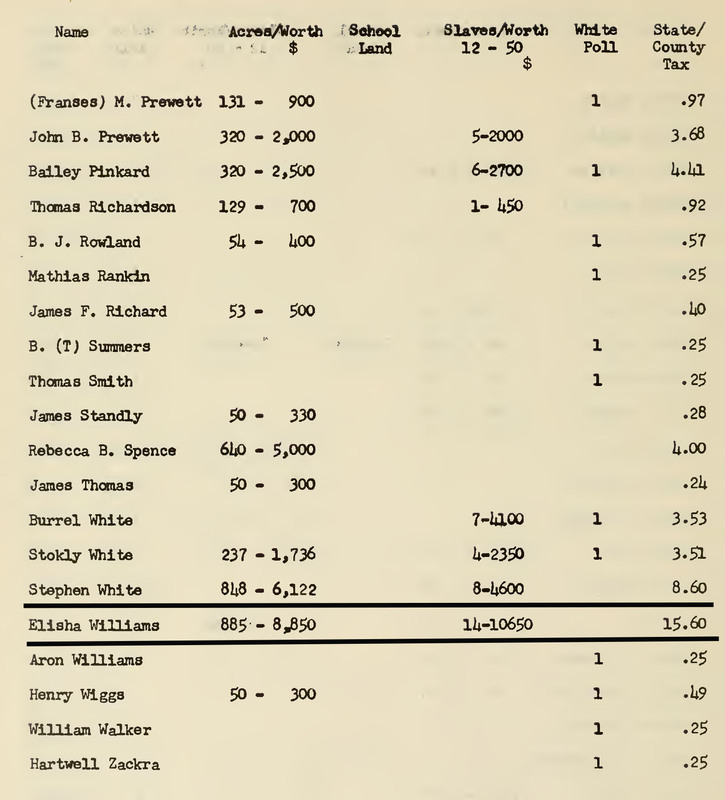 The 1836 Rutherford County Tax roles on line at Middle Tennessee State Library contain the following page showing that Elisha Williams owned 885 acres in that year, although the location of the land is not revealed. On 6 Aug 1838 Elisha Williams Jr received two land grants, one for 39 1/2 acres and the other for 80 acres as shown below. Know ye that in consideration of the sum of twelve and One half Cents per acre paid unto the office of the County Taxes of Rutherford County, persuent to an act of the general assembly of the State passed the 22nd day of November 1823 and entered on the 5th day of July 1824 by N. 287.
a certain Tract or Parcel of Land containing Thirty Nine and a half Acres by survey, bearing date the 31st day of January 1838, lying in said county, On the waters of Stones River, Beginning at a stake - pin oak and cedar pointers 356 2/10 poles West from the North East Corner of a Six Hundres and forty Acre Survey - granted to Elijah Robertson by Grant No. 1669. - Running thence West thirty two poles to a black Oak on the North bank of Stones River - in John Overton's East boundry line two hundred and Eighty Seven poles to a Walnut Stump - Ash and Hackberry pointers; thence East twelve poles to a Stake - pin Oak & two Ironwoods pointers; thence South two hundred and Eight Seven poles to the Beginning. With the hereditaments and appurtenances. To have and to hold the said Tract or Parcel of Land with its appurtenances, to the said Elisha Williams and his heirs forever. In Witness Whereof, Newton Cannon, Governor of the State of Tennessee, hath hereunto set his hand, and caused the Great Seal of the State to be affixed, at Nashville, on the 4th day of August in the year of our Lord, one thousand eight hundred and thirty eight and of the Independence of the United States, the sixty-third. On the waters of Stones River, Beginning at a stake - Oak and Cedar pointers, 356 7/10 poles West from the North East Corner of a Six hundred and forty Acre tract granted to Elijah Robertson by grant N. 1669, Running thence West thirty two poles to a black Oak on the North bank of Stones River - in John Overton's East boundry line; thence South with Said Overton's line four hundred poles to a stake - Ash, hickory and Grouwood pointers; thence East thirty two poles to a state - two Cedars pointers; thence North four hundred poles to the Beginning. This notebook was found in the Register's office and is dated February 1,1853 - November 20, 1862. 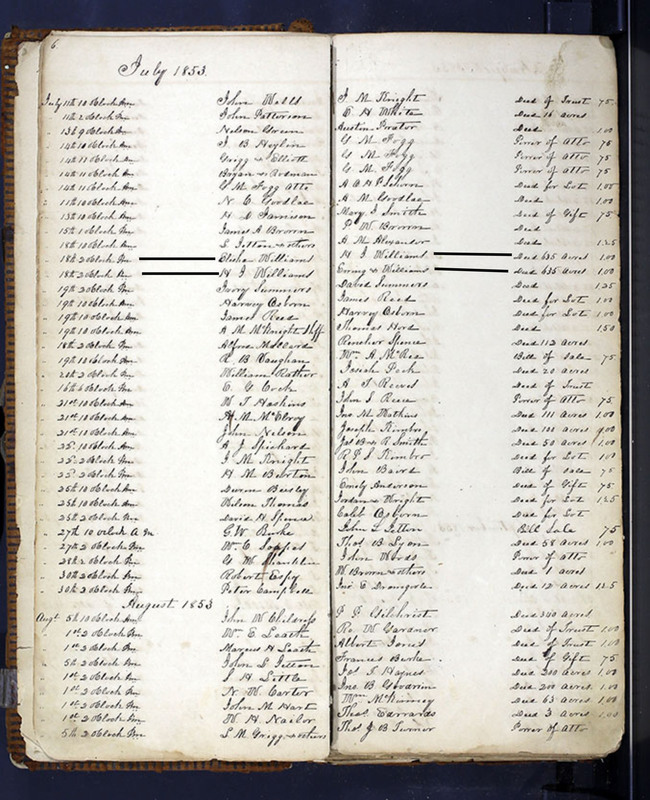 This discovery afforded the opportunity to create an index to missing deed books which were lost during the civil war. The index was completed on May 9, 2013 and is available for viewing in the Register's office. It soon will be uploaded to the online records of the Rutherford County Register's office. We are very excited about this addition to our records for Rutherford County. Please click the image to the right to view the notebook in PDF form. Page 6 of this deed book contains two transfers of properties involving Elisha Williams on 18 July 1853. The first is a transfer of 635 acres for $1 an acre from Elisha Williams to H. J. Williams. 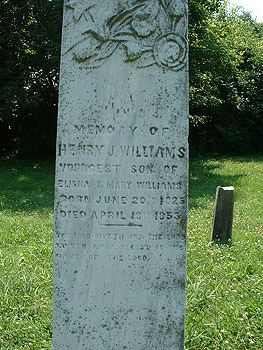 Henry J. Williams, Elisha's son, had died on 18 Apr 1853. Why would Elisha Williams transfer land from himself to his dead son's estate? The second is a transfer of 635 acres for $1 an acre from H. J. Williams to Ewing & Williams. Judge Edwin Hickman Ewing , who became a Tennessee Supreme Court Justice, lived in Murfreesboro before and after the Civil war. Judge Ewing and his two brothers, Andrew and Orville, married three sisters, daughters of Josiah Williams, Elisha Williams brother. The Ewing family was very close to Elisha Williams family and that could explain the name Ewing & Williams in this deed. But it doesn't explain why the land passed through Elisha's dead son's estate. At this point in time, Elisha's only heirs were his grandchildren by his daughter Sara. 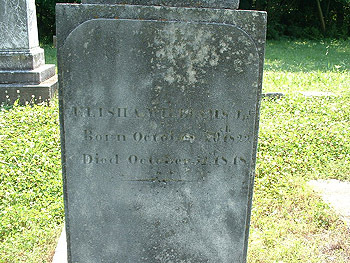 When Elisha Williams died in 1865 all of his children and his wife had died. He left 333 acres to be divided between his living six grandchildren. This property, known as the John Williams farm, is located in District 18 of Rutherford County on the waters of Big Creek. According to the deed record for this property, Elisha acquired the land from John Williams who purchased it on 19 March 1852. I don't believe this where Elisha Williams farmed and raised his family. First, he purchased it after 1852. Second, he moved to Rutherford County about 1805 to farm land his father purchased for him. In 1836 the tax roles show him owning 885 acres in total. 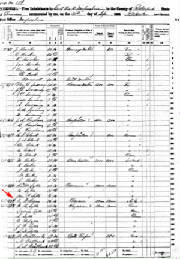 In 1840 his slave schedule showed him owning 50 slaves, enough to farm significant acreage. 1090. Williams, Elisha, Sr. (Actually Jr since his father had the same name. I refer to his son as Elisha III) Died in 1863, testate. Will dated 1 Mar 1859. Codicil dated 31 Aug 1860. Will probated 9 Aug 1865. Wife: deceased. Executor: John W. Childress. The will gave the piano and a good bedstead to Mary Jane Thompson. The personal property was to be divided into two parts, one for his wife's siblings and the other for the grandchildren. In the codicile John W. Childress was to hold the share for the grandson, Elisha Childress, in trust. 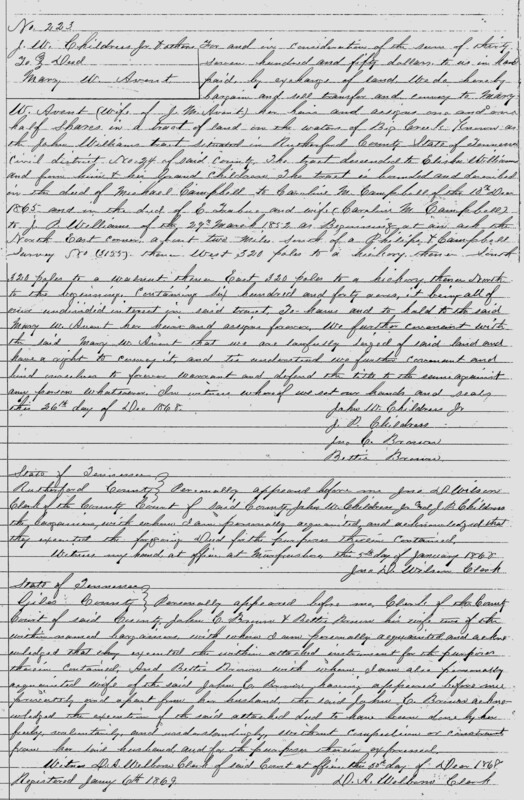 April 9, 1866: John W. Childress was appointed guardian of John Childress and Joseph Childress his own children and minor heirs of Elisha Williams (deceased). James K. P. Childress who died after the testator and who by his will gave his entire estate to his widow, Ellen (Avent] Childress. The court appointed commissioners to partition the land among the six parties. The land was valued at $13,961.25 and each share was worth $2,792.25. February 27. 1868: The court clerk made an estate settlement with J. W. Childress, executor of the will of Elisha Williams, deceased. Note: John W. Childress married Mary E. Philips on 15 Oct 1851. James K. P. Childress married Ellen W. Avent on 20 December 1859. James M. Avent married Mary Childress on 24 Feb 1857. 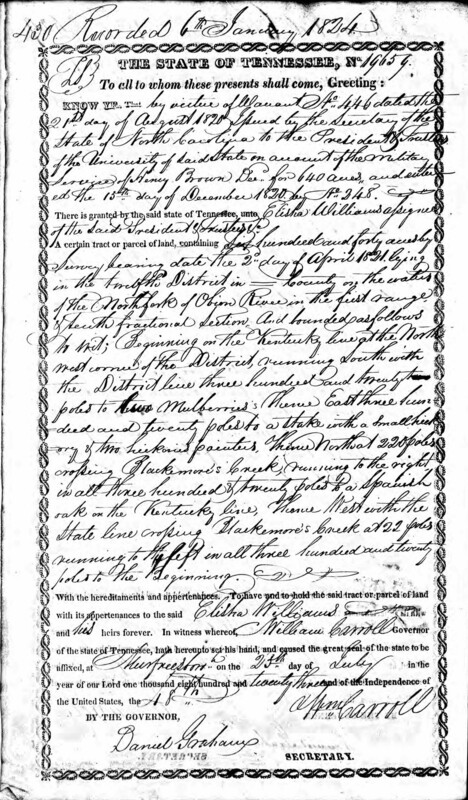 Nearly three years after Elisha Jr died on 15 Mar 1865, his granddaughter Mary W. Avent received her share of her inheritance from her Grandfather Elisha Williams in the below Rutherford County TN deed. For some reason, she ended up receiving 1 1/2 shares of inheritance. The land described lies about two miles south of Phillips & Campbell survey No. (3155) and is 640 acres which was conveyed from Michael Campbell to Caroline E. Campbell and finally to J. A. Williams on 28 Mar 1852 and thereafter to Elisha Williams Jr.
J. W. Childress Jr & others For and in Consideration of the sum of thirty seven hundred and fifty dollars to us in hand paid by exchange of land I do hereby bargain and sell transfer and convey to Mary W. Avent (Wife of J. W. Avent) her heirs and assigns one and one half shares in a trust of land on the waters of Big Creek known as the John Williams tract situated in Rutherford County State of Tennessee Civil district No. 24 of said county. The tract descended to Elisha Williams and from him to his grand children. The tract is bounded and described in the deed of Michael Campbell to Caroline M. Campbell of the 10th Dec 1825 and in the deed of E. Trabus and wife (Caroline M. Campbell) to J. A. Williams of the 29th March 1852 as Beginning at an ash the North East corner, about two miles South of a Philips & Campbell survey No. (3155), thence West 320 poles to a hickory, thence South 320 poles to a walnut thence East 320 poles to a hickory thence North to the beginning. Containing Six hundred and forty acres it being all of our undivided interest in said tract, To have and hold to the said Mary W. Avent her heirs and assigns forever. We further covenant with the said Mary W. Avent that we are lawfully seized of said land and have a right to convey it and tis understood we further Covenant and bind ourselves to forever warrant and defend the title of the same against any person whatsoever. In witness whereof we set our hands and seals this 26th day of Dec 1868. Rutherford Count - Personally appeared before me Jno D. Wilson, Clerk of the County Court of said County, John W. Childress, Jr. and J. P. Childress the bargainers with which I am personally acquainted, and acknowledged that they executed the foregoing Deed for the purposes therein contained. Witness my hand, at office, at Murfreesboro, this 5th day of January 1868. Personally appeared before me Jno D. Wilson, Clerk of the County Court of said County, John W. Childress Jr. and J. P. Childress, the persons with which I am personally acquainted and acknowledged that they executed the foregoing Deed for the purposes therein Contained. Witness my hand at office at Murfreesboro this 5th day of January 1868. The above deed states "The tract is bounded and described in the deed of Michael Campbell to Caroline M. Campbell of the 10th Dec 1825". Read that referenced dead directly below. This indenture made this 10th day of December 1825 by and between Michael Campbell of Davidson County and State of Tennessee of the one part and Caroline M Campbell of the same place of the other part; witnessing; that the said Michael for and in consideration of the sum of five Dollars paid by the said Caroline M to the said Michael, the receipt in hereby acknowledged and himself fully satisfied, doth bargain , sell and convey a certain tract of land lying on the meatus of Stones River in Rutherford County; Containing Six hundred and forty acres, which land was granted by the state of North Carolina to Elijah Robertson, number of grant Sixteen hundred and Seventy two, dated the twenty third day of February one thousand seven hundred and ninety three, and conveyed by said Robertson to Philip Philips & Michael Campbell and said Philips heirs has conveyed their part of said land to the said Michael Campbell all of which are on record in Sumner & Rutherford Counties. 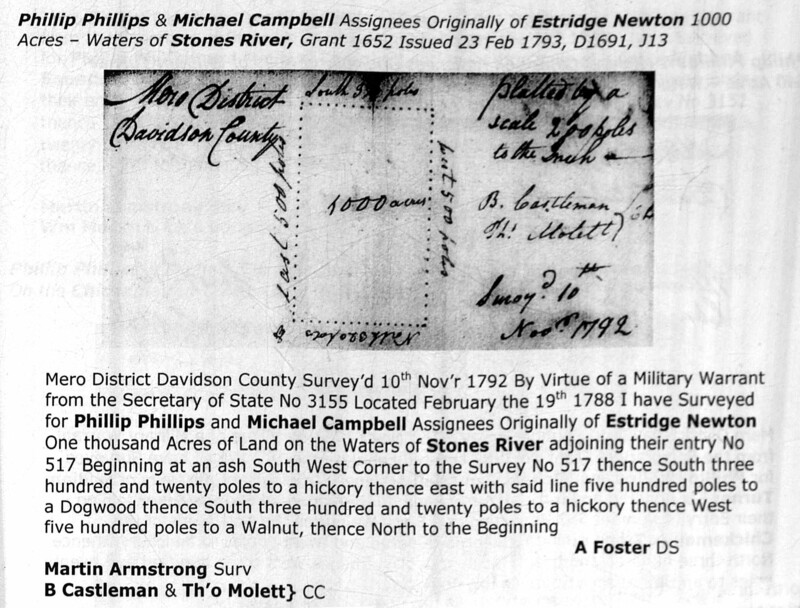 Beginning about two miles south of a survey of Philips Philips & Michael Campbell No. 3155 at an oak, running west three hundred and twenty poles to a Hickory, thence south three hundred and twenty poles to a locust, thence East three hundred and twenty poles to a hickory, thence north to the beginning. And the said Michael doest hereby convey all his right, title, claim, and interest of the above described tract of land, together with all woods, water courses, and everything thereunto belonging to the only proper use and behalf of the said Caroline M Campbell and her heirs forever, and the said Michael will warrant and forever defend the above tract of land from himself his heirs and from all persons claiming by through or under him. I have hereto set my hand and official seal the day & year above written. State of Tennessee, Davidson County Court April Sessions 1830. This indenture of bargain & sale between Michael Campbell of the one part and Caroline M Campbell of the other part was proven in open court to be the act and deed of the said Michael Campbell by the oath of John Dixon & Robert Goodlett the persons being witnesses thereto, and ordered to be so certified. The above referenced Land Grant is contained in File No. 1693, Philliip Phillips and Michael Campbell, Assignees of Wm. Turner (Military Warrant No. 3382), 640 acres of the water of Stones river. It was issued on 23 Nov 1793 and is contained in Book: 76, page 338 under Grant #1654. The 640 acres that Elisha Williams purchased from J. A. Williams in 1858 is likely located as shown on the map below. The dotted line is the Chickamauga Trace. Hwy 70 today pretty much follows the old Chickamauga Trace. The grant calls for the property to start on the trace which is consistent with the description in the subsequent deed from Campbell to Campbell. It's unclear if Elisha had sold part of this tract prior to passing on, or decided only to leave part of it to his grandchildren. One of Elisha Williams' grandchildren, Elisha Williams Childress, died while serving in the Confederate Army during the Civil War and died without a will. The one sixth share referenced below is a different piece of land from that which his sister received below. So Elisha must have made a deed of gift for this Weakley County TN 640 acres to his six grandchildren just before he died. August 3, 1868, County Court: The court noted the death of Elisha W. Childress and appointed John W. Childress Jr. as administrator. 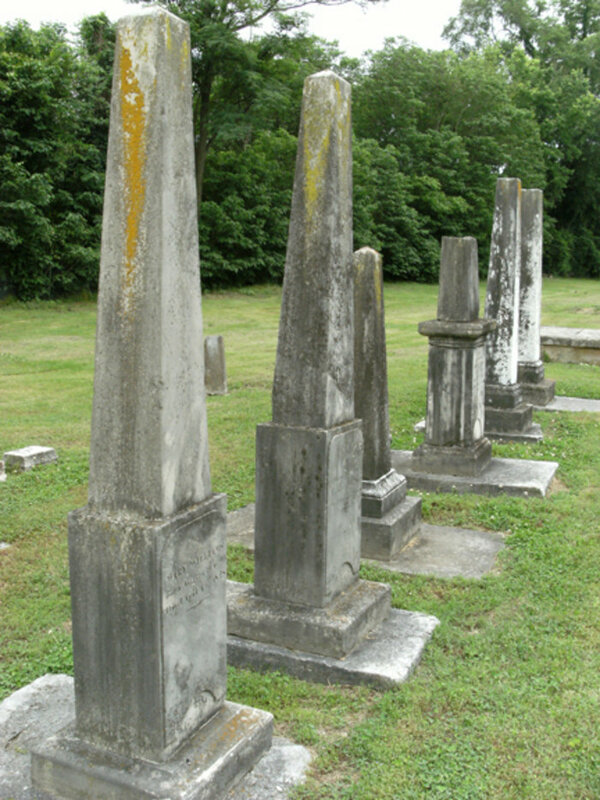 November 4, 1868: John W. Childress Jr., Mary [Childress] Avent, wife of James M. Avent, Bettie [Childress] Brown, wife of John C. Brown and Joseph B. Childress were heirs of the deceased. (Note: The heirs were his siblings from his father's first wife). The administrator reported the insolvency of the estate. The only estate of the intestate was an undivided one-sixth in a 640 acre tract in Weakley County, it being conveyed by a deed of gift on March 12, 1865 by Elisha Williams to Mary [Childress] Avent, Bettie [Childress] Brown, Joseph P. Childress and J. [James] K. P. Childress (deceased) - see below, John W. Childress Jr. and the intestate, Elisha W. Childress (deceased) and granted by the State of Tennessee No. 19659 and founded on Warrant No. 446 issued by the Secretary of State of North Carolina to the President and Trustees of the University of North Carolina on account of the military service of Henry Brown (deceased) and by said trustees and president assigned to Elisha Williams. Elisha W. Childress was never married. The court directed the court clerk to conduct the auction of the land and use the proceeds to pay debts of the estate. December 7, 1868, County Court: The court clerk auctioned the on-sixth part of the 640 acres tract on December 2, 1868 and James M. Avent purchased it for $566. March 4, 1874: A settlement and prorata distribution of the estate of the deceased was presented to the court and accepted for recording. 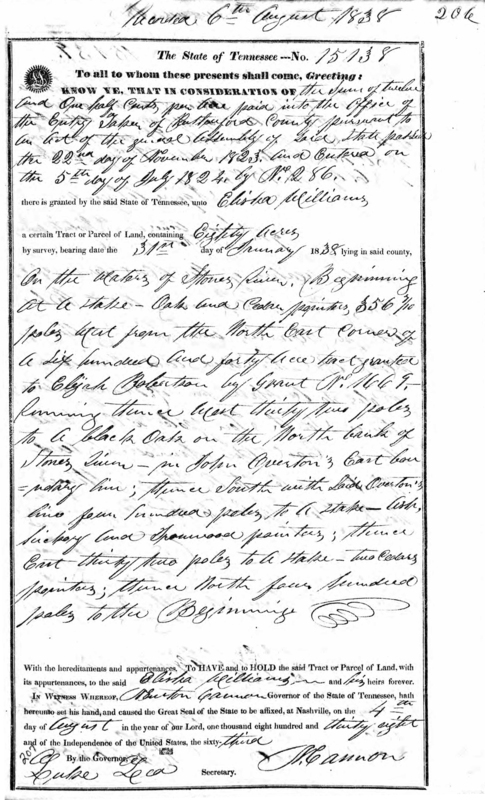 Below is a copy of the original grant as recorded in the County Court of Davidson County. It was obtained from Ancestry.com NC Land Grant data base. In Memory of Henry J. Williams, youngest son of Elisha and Mary Williams, born June 30, 1825, died April 18, 1855 (James Exum Sumner Sr. was his administrator)." Sarah H. Williams, consort of Elisha Williams, born November _____1735, departed this life September 1, 1857. Note from information compiled by Christine (Paradise) Sumner, wife of William Parks Sumner Jr. and mother of Ann Elizabeth (Sumner) Shook and John William Sumner. 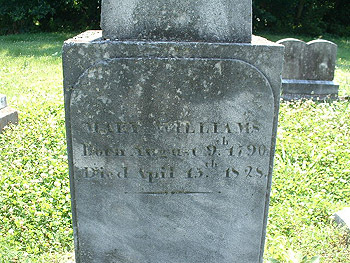 "One of the headstones in the Old City Cemetery in Murfreesboro, TN had the following inscription: Sarah H. Williams, consort of Elisha Williams, born November _____1735, departed this life September 1, 1857" Census record below indicate she was born about 1788 and she was actually born in 1785 in Prince Edward County, VA. 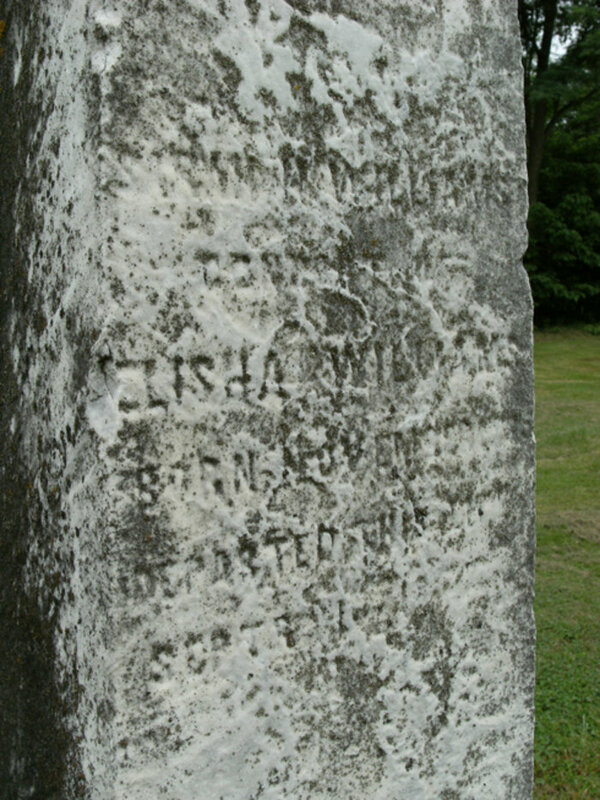 I understand the word "consort" on a tombstone to indicate the husband was still living and that is confirmed by the census records below which show Elisha Williams was living alone in 1760.. I'm not sure if this listing is correct as I have not personally seen them up close. 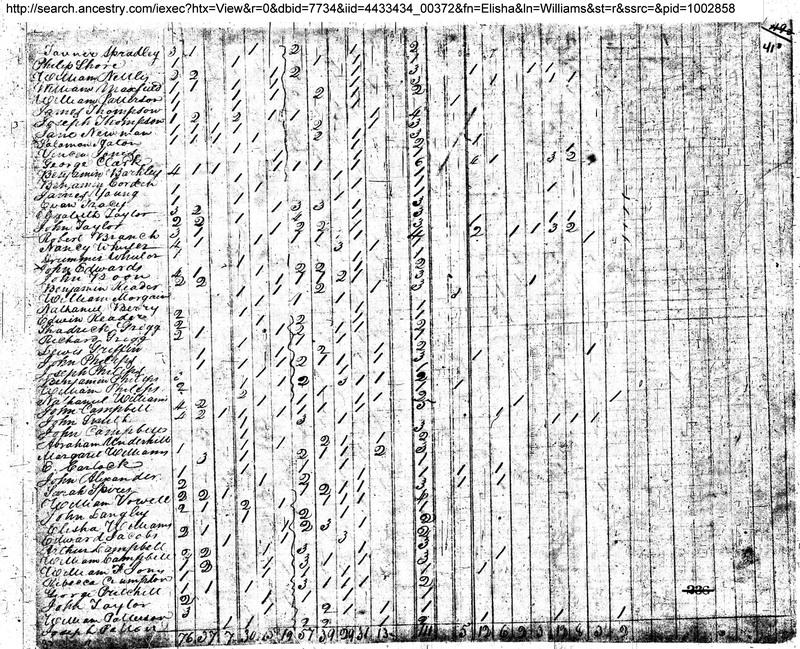 Following are US Census records of Elisha Williams Jr, and Elisha Williams III while in Rutherford County TN where they lived and prospered for many years. 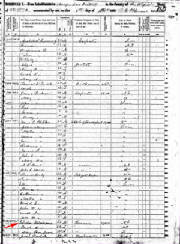 Click on the above image to open a new window with a full size image of this census record.